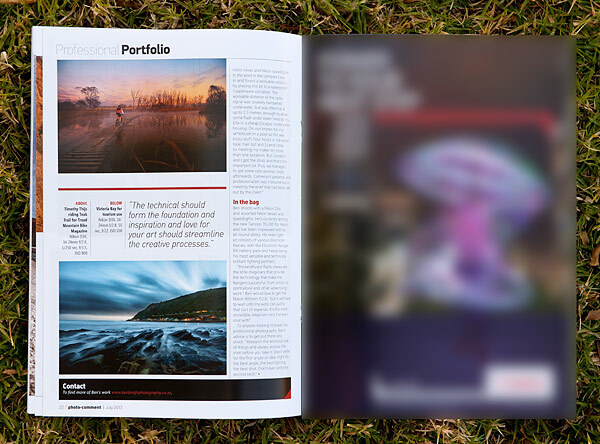 As photographers we are constantly challenging ourselves to improve our technique – creatively and technically. The right kit helps, as does exploring new and interesting ways of getting the shot that stands out from the crowd. Hard work, loads of passion and a smidegeon of luck and it all comes together. 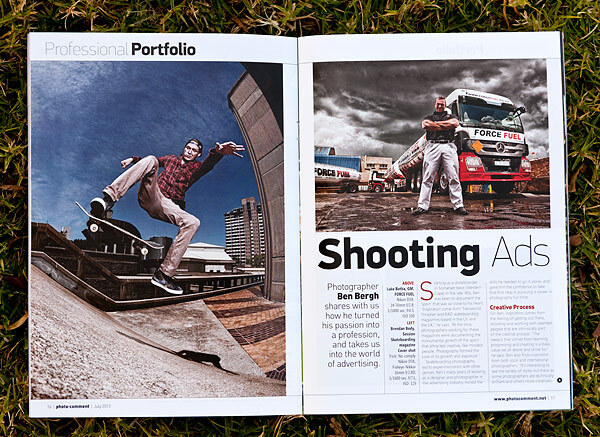 One often forgets that many shots were facilitated by the efforts of your clients, be at an ad agency or corporate. Yes, your clients didn’t set up the lighting or press the shutter release button, but great results come from teamwork, especially when one is fortunate enough to have clients that have the vision to make concepts turn into images and great campaigns. Below are some samples where clients enabled me to get out and shoot some images. Session skateboarding magazine’s 50th edition cover was shot with editor and long-time mate Brendan Body. Many years of working together on Session mag meant we both understood what the look and feel of this cover shot needed to be. Clearly this was less work and more play, and a good balance of those two always make for good results. Force Fuel GM Luke Botha offered valuable input to his corporate shoots in terms of concepts and locations, yet was open-minded enough to give me creative freedom where it mattered and apart from this portrait shot, we created some pretty cool images for Force Fuel’s new campaign, the standout being an image we shot in a tunnel in Alberton at 4 am one pretty chilly Saturday morning. 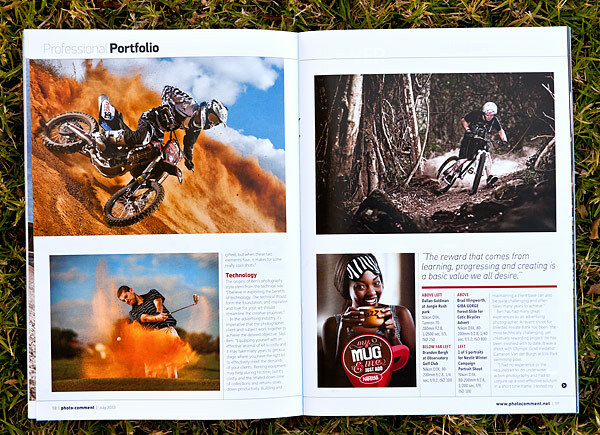 Top SA FMX rider Dallan Goldman, golfer Brandon Bergh, downhill mountain biker Brad Illingworth and a portrait shot for the 2013 Nestlé Winter Campaign (Volcano Advertising). More examples of teamwork between riders, players, models and agency. Effective dialogue with one’s subject is crucial to understanding his/her craft well enough to not only portray it credibly, but to also open a channel of communication that puts the subject at ease, resulting in more a more relaxed shoot for both subject and photographer. Credibility is all important. There’s no point in lighting and shooting a great looking photo if the subject is not looking the part – in action and portrait photography. In action photography, the rider, runner, skateboarder or other need to look credible to those who have an in-depth understanding of the sport. If you shoot a great shot out of context, it shows your lack of understanding of that sport and resultant lack of insight as a photographer. When working with ad agencies, the photographer works with an art/creative director from the agency, and as these individuals are closely tied to the creative origination of the campaign at hand, they are invaluable in helping the photographer direct the subject to achieve the look they have sold to their clients, in the form of a new campaign or related advertising channel. The dam crossing image at Teak Place for TREAD Mounain Bike Magazine: teamwork and the assistance of Timothy Thijs, who was on location at 4a.m., yet still had the patience to ride that wet bridge enough times to enable me to get the shot right. Vic Bay at night simply meant doing the right preparation in terms of location scouting. Shooting long exposures takes patience, but all is worth it when the elements come together. Learn from your subject. 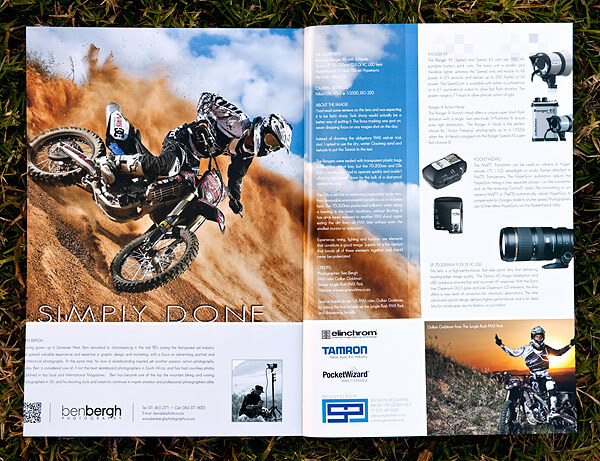 More often than not, the rider will give you the insight to shoot a more credible image. In the end, i think the best results come from the the shoots where everyone is doing all of the above, yet having fun. This is the energy that makes what us photographers do, so rewarding.